Kampala — A local artiste has been remanded to Luzira Prison on charges of uttering offensive communication against President Museveni. Mr David Mugema 31, and his music producer Jonah Muwanguzi 23, appeared before Buganda Road Court on Tuesday. "It is very unfortunate that people were brought to court when it is not constituted, but charges have to be read to them so that they know why they have been brought to court," the presiding Grade One Magistrate Ms Gladys Kamasanyu observed and read out the charges to the accused. Ms Kamasanyu also informed the accused that she had expected a prosecutor from the Uganda Communications commission (UCC) who did not show up because he was attending a workshop. 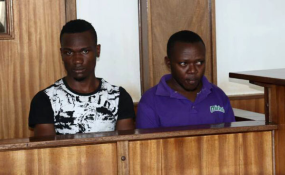 Prosecution alleges that the Mugema and Muwanguzi between 2015 and 2017 at Salama Road in Makindye, Kampala, repeatedly composed, recorded, produced and electronically communicated through social media a song titled Wumula wherein they attacked and disturbed the peace of President Museveni without a legitimate reason. Muwanguzi was also charged with abetment of offensive communication. It is further alleged that Muwanguzi aided Mugema in producing the said song which annoyed the President. Their lawyer Mr Abdullah Kiwanuka applied for bail for them but the magistrate said she would handle the bail application today when the state prosecutor would be present to respond. "Hearing this bail application without a prosecutor may occasion injustice since they will not be heard to tell us the state of the inquiries in the case," Ms Kamasanyu said and remanded the accused.